By Mateusz Mucha and Joanna Andrzejewska. Investment calculator is a simple tool which helps you estimate how much profit an investment will yield in the future, taking into account a fixed interest rate and duration of your investment. You can calculate both final balance of your investment and total interest. It also lets you determine these quantities while including a monthly contribution to your initial investment. If you are interested in property investment, you may check our Cap Rate Calculator which can help you to evaluate a property. Asking yourself whether to make an investment or which product to choose? Planning a trip of a lifetime and wondering if your are going to gather the necessary sum? Are you on track with your financial goals? In all of these situations our investment calculator might come in handy. All you need to know is: how much you want to invest, what is the interest rate and how long are you willing to wait for return on your investment. Determine how much are you willing to invest initially. Decide whether you want to contribute a specified amount of money to the initial sum. Find out what the interest rate on your investment is. Determine the duration of your investment. Do a series of multiplications taking into account the growth of the sum being the base of the interest rate. Find out what your final balance is. Let's try it on a simple example. Your initial investment is 100 EUR. To make it easier - you do not plan to contribute any amount of money during the period of your investment. The duration of your investment is 3 years. By the beginning of the third year your investment sum equals 110 EUR. You multiply it again by 5% and get 116 EUR. If you're planning for a longer investment you need to carry out this operation for every year. Or... you could simply use our investment calculator to do it faster. You can then check what percentage of the initial amount you have earned. You can do this by using our percentage change calculator. This way, you can compare different investments and choose one that suits you best! If you want to know how to calculate the final balance of your investment for a period of time, the equation is the same for any asset: final_balance = initial_amount * (1 + interest_rate / compound_frequency)^(compound_frequency * years). The time period will usually be one year as interest rates are commonly calculated annually. Compound interest is one the most powerful concepts in finance, which most financial/investment products are based on. What it means is that the interest you make every year/month (depending on the compound frequency) is added to your initial investment sum. This way money you invested grows at an increasing rate. Just like in our example above: after one year the interest is not calculated for the initial sum of 100 EUR but 105 EUR that you already made. 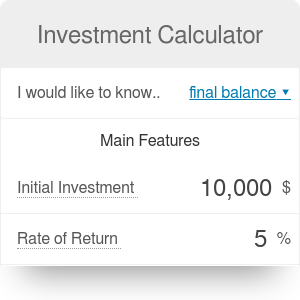 Calculating future value of an invested sum with compound interest can be a bit tricky, so you might want to use our compound interest calculator. Another popular term used in finance is return on investment (ROI). ROI tells you how efficient your investment is or lets you compare performance of a couple of investment options. Mateusz Mucha and Joanna Andrzejewska. Investment Calculator can be embedded on your website to enrich the content you wrote and make it easier for your visitors to understand your message.